Paul Chandler and his wife / business partner Adrian began collaborating with Tom Petersson in 1995, an effort that resulted in the creation of the Chandler Royale 12-string bass. While the production of Royales has now ended, it still represents the upper echelon of 12-string basses. How did your partnership with Tom Petersson come into being? Who instigated the building of the first Chandler 12-string bass? We first met the members of Cheap Trick back in the early 1980's at the early vintage guitar shows. We were still selling Paul C's guitar pins, and were making police badges & awards on the side. Rick was into collecting police memorabilia at the time and contacted us in that regard. Rick is pictured wearing a jacket with some of our pins on the cover of Cheap Trick's "Standing on the Edge" album. (Remember albums?) A few years later at a NAMM show Rick & Robin stopped by our booth to say hello. Robin tried one of our hollow "Telepathic" guitars and really liked it. We built him one which was unfortunately stolen when their truck was broken into later. My wife Adrian was always a Cheap Trick fanatic and would always chat up Tom Petersson at their shows or at guitar shows, they became good friends. By 1995 we had attended many Cheap Trick shows and knew the band members pretty well. At this time, Tom was playing this weird Japanese 12-string bass with a dragon inlay on the body and these funky guitar humbuckers crammed in the top. It had been heavily modified and weighed a ton. I had always thought Hamer instruments were cool and asked Tom why he wasn't playing his Hamer. He told me he didn't have any Hamers anymore (but as you probably know, TP is always joking around so who knows). Anyway, I told him I thought he should be playing an American guitar... American guitars have always defined guitar sound and are the best. Tom stopped by our factory after one of the band's San Francisco shows with that Japanese bass for minor set-up work. He spoke with Adrian while I tweaked. Tom had asked Adrian several times about creating a new 12-string bass, but I was busy with other projects at the time. With me trapped at the workbench, Tom and Adrian double-teamed me into agreeing to try designing and building a 12-string. Usually I would never make an instrument that I wouldn't personally use, so I really didn't have a design concept. I took that opportunity to measure all the critical aspects, examine the angles and parts, and ask TP questions about the guitar. The idea was born at that time. What were some of the details Tom specified that he wanted? Did he have much to do with the overall design or were those choices mostly yours? Tom Petersson with his first Chandler Royale 12. On a subsequent visit to our workshop, TP was waiting for me to get off the phone, intervene between quarreling employees, and put out the usual array of little fires that would arise during my fun, carefree days. In our conference room I gave him this book about the history of German electric guitars to look at while waiting for me. Within 15 minutes Tom was deep in the world of Klira, Hopf, Hofner - the craft of Erlangen-Bubenreuth, the heart of Frankonian Lutherie. You have to realize that some of these German Guitars from the mid-1950's & 1960's are really strange, mostly big arch top jazz things with wild plastic bindings & overlays. TP can hardly get through a week without buying at least one guitar, and he prefers the unusual. By the time I got to the conference room, TP had picked his dream guitar design out of this book, with a scalloped top, lightning-bolt "F" holes, and 10 lbs. of celluloid integrated into the body and neck. You know, something completely un-manufacturable. I explained to Tom that perhaps that particular German builder had gone out of business because their designs weren't exactly practical or realistic. Anyway, it was a fun meeting and we agreed on a basic body shape and basic features. When you were developing the concept for the Royale did you examine and play any other 12s, and if so what were they? Did Tom supply them? Tom left me the Japanese Dragon 12-string for a few weeks. I asked him to jam around on the bass a little bit and closely watched his technique. First, a pick was always used. On single note runs, it was all down-strokes. But he would also grab intervals & chords up the neck and strum it like a giant guitar. That was when it occurred to me that we weren't really building a bass at all... we certainly weren't building a regular guitar... this instrument would have to be its own thing, combining elements from basses and elements from guitars to create something new in its own class. I tried to truly open my mind and start from scratch. I wanted a more guitar-like feel to the neck; not too wide, not too thick. You have to understand that these instruments are under a tremendous amount of string pressure, and to emphasize the twang you need to create additional string tension by having a pitched headstock, high neck/body joint, and high-tension bridge assembly. The neck is cambered to give a slinky action which requires substantial neck stiffness and adjustability. This action function, along with the overall sound has driven the design and development of the Royale. How many Chandler 12s does Tom have now? Are they different in more ways than just the finishes? The first 12-string we made for Tom was mahogany body, Tortoise binding and head overlay, Maple neck with a flat graphite slab parallel to the fingerboard. Verdict: neck pickup not loud enough, graphite slab was exposed at edge of neck... slightly reflective and hard to see position dots, heavy body, sharp corner at neck/body joint. This is the orange guitar that he still plays sometimes. Delivered in 1995 or early 1996. The second 12-string we made we switched to a lighter swamp ash body with a contoured neck heel like my old Macaferri guitars. Also, we switched to two graphite bars inlayed in the neck under the fingerboard. This guitar is black with white pearl binding and the new "stairstep" pickguard shape. Delivered late 1997 or 1998. It was during this time that we relocated from the SF Bay Area to our property in Northern California. Ahh... country life! The third 12-string took the new specs of the second guitar and added 2 strips of Wenge wood to the neck for additional rigidity. Also, Adrian and I developed a new humbucking pickup for the middle and bridge position that we wanted Tom to try. Working with Rolly Salley of Chris Isaak's band, I became aware of the problems that traveling musicians have with residual noise from single-coil pickups, especially in television studios. I felt Tom's needs would be better served by the humbucking pickup. Besides, we wired the pickups for series (normal humbucking), split (single coil), or parallel (low output bright humbucking), so he could get back to his original sound with the flick of a switch. Tom loved the big, full sound of the new pickups, but didn't like the high fidelity sound of the parallel sound, so I rewired his bass to replace the parallel setting with a "pickup off" setting. We had some old pearl plastic celluloid and covered the top of the guitar with it. This is the blue pearl guitar and it became Tom's current spec... delivered March 2000. The fourth 12-string is just like the above one but with a teal green pearl top. It was delivered July 2001. I believe this is his favorite. He, the band members, and the sound techs all tell us that this one is magic. In December of 2001 we built a Candy Apple Red 12-string for Tom, but he wasn't too crazy about the color so he let us sell it to another customer. So now he has the 4 guitars, but he & Adrian are cooking up some new guitars for us to build; same specs, different cosmetics. Back stage at a Cheap Trick show - with four Chandler Royale 12-string basses. The Royales Tom owns have gone from very traditional finishes to very flashy pearloid tops. Who's idea was it to put pearloid finishes on those basses? Are those options available to the public or just on special instruments for Tom? I thought the pearl tops would further capture the feel of those old German guitars Tom liked, so I thought we'd try it. The material is difficult to get and work with, so at this time Tom has the only ones in the world. We will be doing a batch of a dozen 12-strings soon, I think I have enough material left to do 3 tops maybe. Otherwise, we can do most of the regular type finishes as well as our supersparkle ones. The Royale quickly became known as the "Rolls Royce" of 12-string basses. Was this always the plan or did that level of attention to special details develop over time? The longer we stay in business, the more it has come to me that we don't have to be the biggest or the baddest... we just want to make really nice, well thought-out products for people who can appreciate them. I am flattered to hear of the customers' praise for the guitars. I have to tell you, building a 12-string bass is like building 3 guitars. The bridge requires a lot of hand work, of course the nut is very complicated, and we really try to make each one the best possible in all areas. I especially appreciated it when one customer called Adrian after receiving his Royale and told her "It exceeded my expectations". Obviously, the longer we make them, the more we learn and the better the guitars get. Can you detail the construction of the Royales? How much do they weigh on average? Body: 2 or 3 piece solid swamp ash, polyester finish. Neck: laminated from 3 pcs. maple, 2 stringers Wenge, 2 bars of graphite, Pau Ferro fingerboard; 21 med jumbo frets & 12-inch radius, single 2-way truss rod, graph tech "tusc" nut, nut width: 1-13/16 in. ; 34" scale, basically a little wider than a Les Paul. Electronics: Neck pickup: split humbucking high output; middle and bridge pickup: humbucking soapbars; various wiring and output options available upon customer order. Hardware: Gotoh Tuners, Schaller Strap Locks, Custom bridge and tailpiece, all chrome plated. Weight: I have my 12-string on loan to Tom Hamilton of Aerosmith right now so I can't weigh it for you, but I think they are approximately 15 lbs. based on our UPS shipments. Editor’s note: The bass being used by Tom Hamilton was returned to Chandler and ended up with Shalini Chatterjee. Who designed the bridge and tailpiece and what went into that process? I designed the bridge. The bridge uses 8 saddles as the 2 octave strings intonate in the same place and the fundamental string intonates in a different place. The tailpiece matches the bridge string spacing so the strings don't flair out behind the bridge to pass through the tailpiece. Also, the tailpiece has a channel milled into it to conceal the string balls. The pieces are fabricated from brass, chrome plated. Most high-end 12s come standard with active electronics, but the Royale's pickups are passive. What were your reasons for choosing passive pickups? TP will no way even consider having a battery anywhere near any of his basses. He feels it is just something else to go wrong. I thought it might be worth a try but it is a forbidden topic with him. In keeping with his original idea and sound, we have tried to offer maximum flexibility through switching and signal routing within the passive realm. We have made one Royale with active electronics; this was ordered by Glen Pavan at Guitar Center, Hollywood and recently purchased by a great 12-string player, Rodney Mollura from LA. The Royale has a unique string-spacing with the octaves being further apart from the fundamentals than most other 12s. Who came up with this idea and why? The octaves are tightly grouped together and slightly separated from the fundamental strings. With a little finesse, you can pluck them separately. The idea is to hit a harmonic on the octave strings and pluck a lower note on the fundamental, offering a wider range of sound. Also, I feel it helps to keep the octave strings from being "masked" by the massive signal produced by the fundamental strings... just that micro second of delay in your picking action gives the octave strings presence and definition. I've played regular 12-string guitars that have the fundamental string first and you can barely hear the octave string when playing. What's up with that? It defeats the whole purpose. The Royale has a very vintage'look to it. Were there specific instruments from the past that inspired its appearance? 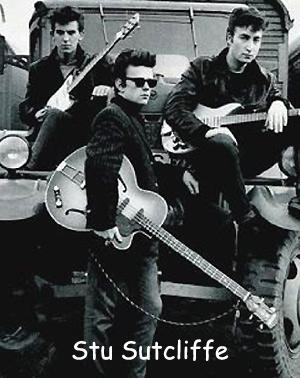 If you look at those old Hamburg-era Beatles photos, Stu Sutcliffe has this ancient Hofner bass, 1-cutaway typical German guitar for that time. That's what we're going for. Most of the customers buying the Royale are Cheap Trick or pop music fans, and seem to like this retro styling. I like it anyway. The first time I personally saw the Royale was on the cover of Cheap Trick's 1997 release "Cheap Trick". Did having that bass on the cover of that record generate a lot of interest in the Royale and in Chandler in general? We have been in business since 1980, which I think is a long time. You can advertise all you want, but with so many guitars and guitar companies out there it just becomes visual "noise" on the magazine page. Having our guitar on the CD cover helped to put the guitar in a different setting. I think it definitely helped our sales and brand recognition. You can always tell if I've been in a record store because the "Cheap Trick" CD section has that cover with our bass on it facing out! Has the company's focus changed since you began building the Royales? It appears that they are becoming some of Chandler's most visible instruments. We started building guitars that were very Fender inspired in the 1980's. Customers liked our nice woods and finishes as well as our unusual features and pickup/hardware combinations. Fender was pretty much on the straight and narrow at that time, offering standardized guitars and basses. Today, Fender offers many combinations and is doing a much better job of making guitars than they were at that time. Also, there are many companies making Strat and Tele style guitars at various price and quality levels. We decided to try our own thing and concentrate on our original designs. The market might be smaller than the mass market, but that's OK; we don't have to build 400 guitars a month. The company is financially strong enough that we don't need "busy work" rehashing what has already been done just to cover overhead expenses. In music, it's like playing "Sweet Home Alabama"... great song, wish I'd written it, etc., but there's no significant future there. It has taken us a long time to get to this point, but we're proud of our past and glad to be here. Has Chandler built any 12's with 'non-standard' features, like weird string arrangements, fretless versions, graphite necks, etc.? The first 12-string we ever made was for the late Allan Woody, one of the best players I ever had the supreme pleasure to jam with. Miller Beer commissioned a Korina Flying V 12-string bass with their graphics for him when he was playing with Warren in the Allman Brothers. It had 4 Chandler Lipstick pickups and one of Adrian's Red Booster active circuits. 30" scale, cool bass. All the others have been the regular Royales. The first Chandler 12-string bass. Are there any finishes that are more difficult to work with? Any that present substantial mechanical difficulties? What's your favorite finish and why? The supersparkle finishes are by far the most difficult to work with. The flakes are not metal, and become statically charged, causing stray ones to stick to the wall of the booth, to the floor, to the operator's clothes and shoes, and to your hands. This process requires several additional steps to create a flat, glossy finish. When they are done, the effect is stunning, especially under stage or sun light. I guess I like these best, although they are very bright, loud finishes. What do you see as the next step in 12-string bass evolution? Any new technologies or features coming online that you're aware of that could be incorporated into a 12? We recently changed from a Delrin nut to a graph tech "Tusc" nut. I find the material much easier to work with than the delrin material and the results much more predictable. Last year we introduced a new light gauge string set for 12-string bass. The lighter gauge plays really fast and is easier to get around on. I think the new string gauge makes a world of difference in the way the Royale plays... sweet! Blue Pearl finish Chandler Royale 12-String Bass. It was delivered to Tom in March, 2000 and later donated to the Hard Rock Cafe in Tokyo, Japan in 2006. My friend Steve Masonek here in Chico has developed two new truss rods for us. We will be using the new rod in our next batch of Royales. It is a heavier rod than anything commercially available before and offers positive adjustment in both directions. This other neck tensioning system Steve came up with is unlike anything I've ever seen used before; we are testing it and may incorporate it at a future date. It's pretty cool... simple, minimal removal of wood from the neck... super adjustable. Also, I recently started tuning my Royale with one of the octave strings of the "G" (the middle one) tuned to a "D" note... a 5th, so the "G" is tuned high G -- D -- low G. This way, when you grab a note on the "G", you're grabbing a power chord. It sounds like two instruments playing, and where the chords would be weird in the scale or song you're playing, you just play on the other strings. When Tom Petersson tunes his bass, one of the octave strings of each note is slightly detuned to create a natural modulation or slight chorus effect. Is there a particular recording that you feel best exemplifies the overall sound of the Royale? That's a tough question... I like the Cheap Trick material of course. My bass player Mark Masonek does some great stuff in our power trio on 12-string, and the guy in Pearl Jam (Jeff Ament) has done some nice stuff on a 12-string too. Personally, I like to hear the octave strings clearly. The bridge pickup on the Royale is located close to the bridge so that it does not pick up a lot of low frequencies. I like to run this pickup to a guitar amp for maximum twang and the other 2 pickups into a regular bass amp like a GK or SVT for the lows. The middle pickup on the Royale offers the best sound of any of its pickups, I think. It is in the sweet spot for that instrument. Thanks Paul for taking the time to talk with us and being interested in what we are doing here at 12stringbass.net! You make beautiful instruments and it has been a pleasure! Best wishes to you and your company! I know this is a lot of info, but that's the whole story. Thanks for your interest in our company. Editor’s note: This interview with Philip Snyder was originally published on August 5, 2003.